If you use the Internet, it’s very likely some form of malware is already at work on your PC. Spyware can track your online or offline PC activity and may save or transmit those findings to others. Computer viruses can alter the way your computer operates and often cause significant damage to your PC. These unwanted programs are stealthy and often attach to your computer without your knowledge or consent. Hackers can use spyware, viruses or simply attack your PC directly. it may be because of malware installed on your PC without your knowledge. Identity thieves can ruin your credit rating and the standing of other personal information by stealing your passwords,account numbers and national insurance numbers online. Half of all credit card fraud is conducted online. Fraudsters routinely steal account numbers and passwords while you conduct your normal online computing. If your credit card is mysteriously charged your PC may be infected with malware. Slow PC or frequent computer crashes? Even a small amount of malware on a system can slow down computing and crash your PC because it operates in the background, sapping hard drive resources. Familiar with pop-ups and spam? Harmless enough, right? Don't be fooled. While many pop-ups and emails from reputable companies are safe, the adware programs that generate illegitimate pop-ups are capable of installing spyware to hijack your browser and capture your personal information. Spyware can cause some unexplained PC behavior, especially for your browser. So if things are happening that you did not initiate, you may already be a victim. Some common changes in behavior include: mysterious new toolbars you can’t delete, unexplained changes to homepage settings and suspicious search results. The more kids explore online, the more they are at risk from predators and the more they put your PC and privacy at risk. Ransomware is a NEW kind of malware (malicious software) that attempts to extort money from a computer user by infecting and taking control of the victim's machine, or the files or documents stored on it. Ransomware gives criminals the ability to lock your computer from a remote location. Then it will present a pop-up window with a warning that says that your computer is locked and claims that you will not be able to access it unless you pay. In 2012, we saw multiple instances of 'police-themed' ransomware that cunningly disguise their ransom demands as official-looking warning messages from a local law enforcement agency. Ransomware is usually installed when you open a malicious attachment in an email message or when you click on a malicious link in an email message, instant message, social networking site, or other website. Ransomware can even be installed when you visit a malicious website. Make sure to keep all of the software on your computer up to date. Make sure automatic updating is turned on to get all the latest Microsoft security updates. Don't open spam email messages or click links on suspicious websites. To detect and remove ransomware and other malicious software that might be installed on your computer, run a full-system scan with an appropriate, up-to-date, security solution. IF you cannot remove it yourself give us a call and we can help, although please note this "May" mean wiping your computer and installing the operating system again, however we will do out best to keep all your personal documents emails and pictures and restore them afterwards. 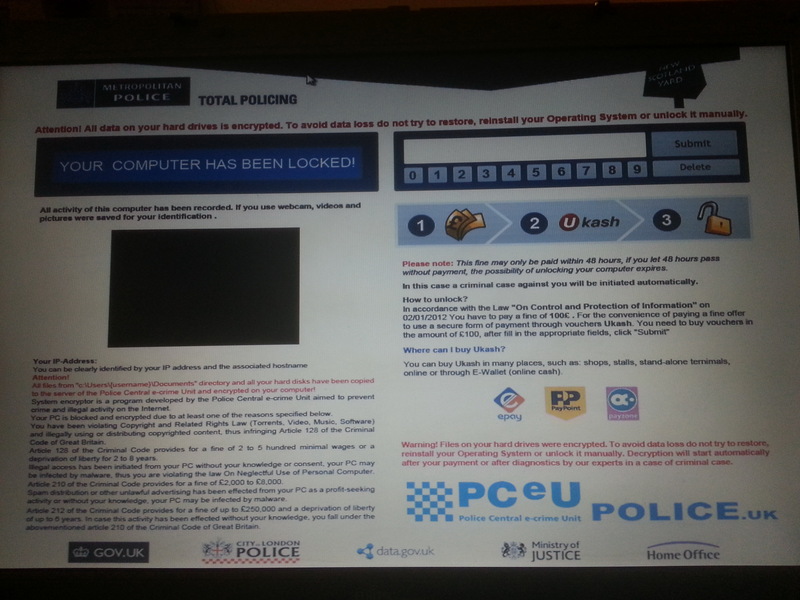 Ransomware can appear really scary - this is an photo of what one teenager got on his laptop which then locked up and all he could get was this screen demanding he paid money to unlock it. This scared both him and his parents who both thought they were in serious trouble even though they had done nothing wrong. It was a fake though and I was able to restore his computer and keep his personal files. Spyware travels over the Internet and infects your computer. Opening e-mail attachments or clicking on pop-ups, even ones that seem genuine such as those advising you that you're pc is infected and you need to download new antivirus software or do an online scan. Operating silently, spyware collects your information. Without your knowledge, spyware runs in the background while it records your Internet browsing habits and keystrokes, monitors the programs you use and collects your personal information, which can lead to credit card fraud and identity theft. Spyware uses your Internet connection to transmit your information to identity thieves.